This site is located between Ribbon Reef Number 2 and Ribbon Reef Number 3. It is about 114 kilometres north-north east of Port Douglas. The GPS Reading for this site is S15° 30' 45.7" E145° 46' 38.9" using WGS84 as datum. Please read the GPS page from the left menu if you are not familiar with datums. 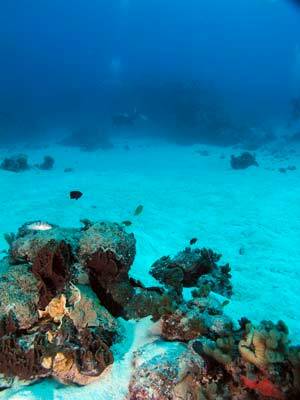 As mentioned, the reef is located between Ribbon Reef Numbers 2 and 3. It is inside the entrance created by the gap between the two reefs and is about 1.6 kilometres south-west of Steves Bommie. This dive site is located on the western side of a reef about the size of the MCG (Melbourne Cricket Ground for the cricket ignorants). 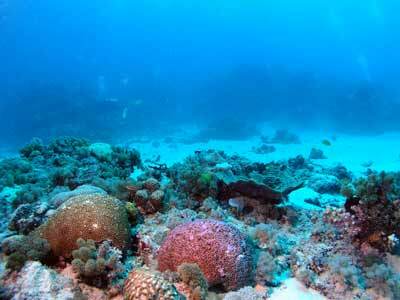 It has a wall that runs roughly north-south which is composed of a lot of small and large coral bommies. These go from about 2 metres down to 6 metres or so. At the bottom of these, the bottom slopes away to about 25 metres and then to 30 or so metres. In the area between 6 and 15 metres there are a number of coral bommies. These range from very small to quite large. Past the 15 metre depth there are some smaller coral bommies. The mooring is located on the main reef and is at about 5 metres. Once you descend, drop down to the sand, do not go down the mooring. There is no need to go deeper than about 25 metres on this dive as there appears to be nothing but sand past this. Head either north or south, depending if there is any current. We had only a very slight current so we headed north (with it). As you go you will see the bommies. Examine each one in detail as they are normally home to some quite interesting things. 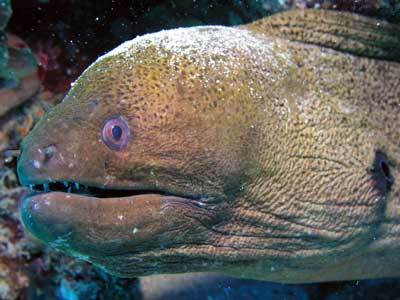 Some of the bigger ones have small cracks and holes and can house giant moray eels. 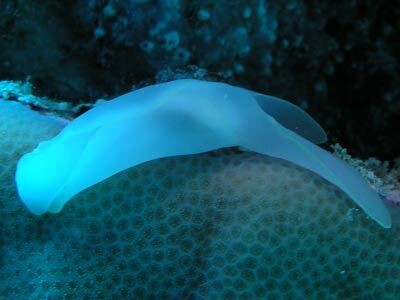 On the coral you may also see some interesting nudibranchs and shellfish. 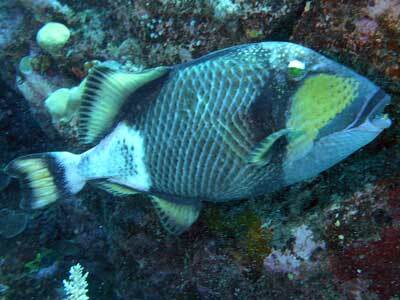 Around the bommies there are also normally lots of small tropical species like bannerfish and butterflyfish. Out over the sand you may see some white-tipped reef sharks as well as rays. Once you have travelled for about 20 minutes, head shallower up to the area just off the main part of the reef. The depth here is about 8 to 12 metres. There are more bommies here. On the main reef there are some huge brain corals that are perhaps 5 metres across and high. 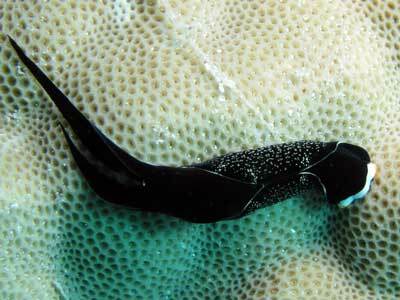 On the main reef you may see cuttlefish, titan triggerfish as well as lots of surgeonfish. This is not a bad site. The visibility was about 25 metres and the water temperature about 26° in October.